Here at Baking Beautiful we create gorgeous, contemporary Wedding Cakes from our professional kitchen in Maidstone Kent. Every bespoke Wedding Cake is made with skill, design flair and attention to detail to provide a beautiful centre piece as unique and individual as you are. Baking Beautiful specialise in iced Wedding Cakes and are skilled in creating stunning classic designs using modern techniques including piped royal icing, delicate lace and stunning sugar flowers. 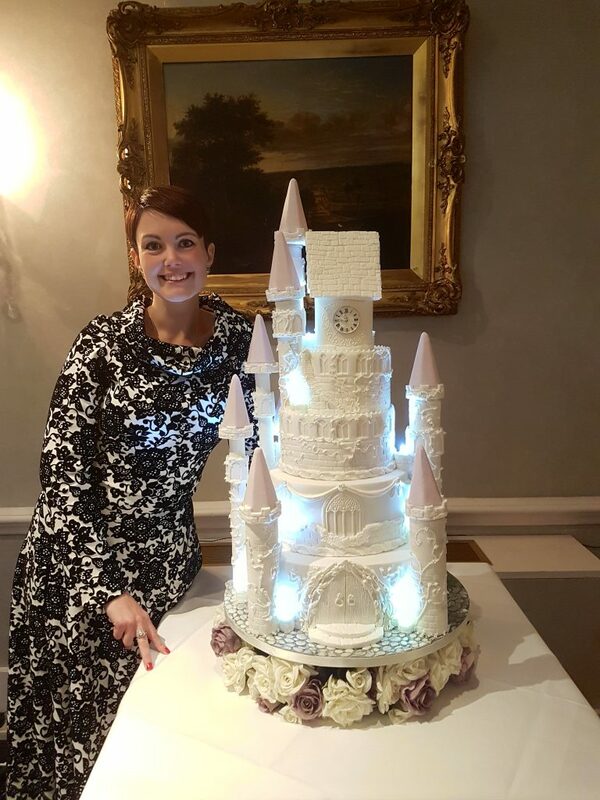 We are lucky enough to work with some amazing places delivering wedding cakes to beautiful Castles such as Wadhurst Castle, Leeds Castle and Hever Castle. Manor Houses such as Bradbourne House, Chilston Park, Salomons Estate, Wotton House and Nettlestead Place and converted Barns like Elvey Farm and the Old Kent Barn. We also work with fantastic Hotels and Restaurants including One Warwick Park, The Bistro Bewl Water, The Swan, The Marriot and The Village. We also supply many other venues in Maidstone, Tunbridge Wells, Sevenoaks, Ashford, Dorking, Canterbury and East Malling. Hello, my name is Caroline and I live in Maidstone, Kent, with my husband and 2 children. After a career as an in-house wedding planner I decided to turn my passion for cake into a fully fledged business. I have combined my knowledge of weddings with my love of cake decorating and baking, and now create luxury wedding cakes using the finest ingredients. I eat, sleep and think about cakes constantly, and love to keep learning and perfecting my craft. I have been an intern at a London Cake Company and I like to learn new techniques with top class sugar craft instructors. I use these skills not only to bake beautiful wedding cakes but also to compete in national competitions. I provide cakes for weddings throughout Kent, and also for clients in Essex, East Sussex and Surrey. During my consultation days, I welcome couples into my home for tastings, and to talk about the design and flavours of their wedding cake. I can also provide egg free Wedding cakes suitable for Asian Weddings.